There’s something ironic about the fact that the transport industry so often embodies the adage ‘what goes around, comes around’. I’ve lost count of the number of times it has had to painfully relearn lessons it has forgotten. More positively, it has often innovated similar projects in slightly different ways. For instance, there’s a slow-burning revolution in electric road vehicle technology going on at the moment. I love the whole concept of electric road vehicles (would anyone like to lend me a Tesla Roadster or a BMW i8 to road test for a future article? No? Oh well…) and these days I actually see one occasionally on local roads. But it’s the public transport industry that’s really taking the lead in showing that electric propulsion is a truly viable solution for road transport, not just a novelty. There are increasing numbers of straight electric buses entering service in cities around the world. Recharging strategies vary widely, and I’ve no doubt some will fall by the wayside as the technology matures. But it’s this part of the transport industry that will drive improvements to battery technology to increase vehicle range, and recharging techniques to improve top-up speeds. This will enable the trickle down of such improvements to the private electric car market, making electric cars a genuine replacement for diesel or petrol-engined cars in an ever greater set of circumstances. Let’s face it, it’s beginning to look as though diesel engines aren’t the solution to air pollution concerns. Public transport has been a pioneer in electric propulsion before. At the turn of the 19th and 20th Centuries city public transport operators were showing what electric propulsion could do for rail transport. Bristol’s tramways went electric in 1895, replacing under-powered and street-polluting (ahem) horses, while London’s City and South London Railway (its first deep-level underground line) opened even earlier, in 1890. It was powered from the start by electricity, and compared to the fuggy cut-and-cover underground railways opened a few decades earlier (we know them now as the Metropolitan and District Lines) the C&SLR’s trains were a revelation. That’s not to say the technology wasn’t without its early problems. The lights inside the carriages used to dim dramatically as the electric trains hauled themselves up in the incline into King William Street station (which itself was lit by gas because there wasn’t enough spare electricity). Electricity was clearly the future. The only problem for transport operators wanting to electrify their networks was that there was no national electricity grid to plug into. If you wanted electricity for your trains or trams, you had to generate it yourself. So, just a few years after Bristol built its tramway power generating station (which we looked at last week), a new and much larger power station was to rise on the banks of Chelsea Creek, just by the River Thames, at Lots Road. Construction started in 1902 and it opened in 1905 (Taylor, 2001), serving the needs of the Underground Electric Railways of London Company (UERL). It enabled the conversion of the Metropolitan District Railway (today’s District Line) to electric power, and the subsequent opening of the UERL’s Bakerloo, Piccadilly and Hampstead (now the Northern Line) deep level tube lines with electric power from the off. Lots Road Power Station was designed by James Russell Chapman, the UERL’s engineer. Just like Bristol’s tramway generating station, its vast hunger for coal (700 tonnes a day) was fed by barges. Unlike the Bristol tramway generating station however, the architecture of Lots Road Power Station was far more austere. Finished in red brick, the main structure comprised two halls, both having pitched roofs with clerestory windows running along the top. The larger boiler house had four chimneys, one towards each corner, while the turbine hall on the north side was slightly smaller. Breaking up the plain brick walls were large, tall arched windows, allowing natural light into the cavernous depths of the huge building. The arched tops to the windows, with conspicous key stones, are one of the few ornamental feature of the building’s exterior, along with a band of raised circles running along the building just under the roof line. Lots Road Power Station did away with the Classical ornamentation seen at the Bristol tramway generating station and in fact its architecture was virtually proto-Modernist by comparison. Like Bristol’s tramway generating station, Lots Road has a steel frame to provide structural support, so the external walls aren’t load-bearing, which is how they were able to contain such large areas of glass. That was also a good thing for the power station’s neighbours. The turbine hall of Lots Road Power Station faces straight onto Lots Road itself which has a row of houses on the other side. It wouldn’t have been much fun for the residents if they had had to look out onto a plain brick wall that size. So, an unadorned brick-faced power station with a chimney near each corner of the largest part of the building… If you’re thinking this is a familiar-sounding description, you’d be quite right. Lots Road is the design grandfather of the much more famous, and definitely Modernist (no arches at the tops of windows here) Battersea Power Station, which opened in 1933. Much as Battersea Power Station later sported, Lots Road Power Station pioneered a super stylish control room, more Art Nouveau than the Art Deco stylings of Battersea’s. You can see a picture of it here. Lots Road Power Station was to end up supplying the electricity for all of the Underground network except the Metropolitan Line, which retained its own power station. During the Second World War, the fact that the London Underground network had its own dedicated power station, separate from the civil supply, was considered highly advantageous. Even if London above ground suffered a power cut through bombing, tube trains would continue running and not be trapped in the narrow tunnels far below the surface. 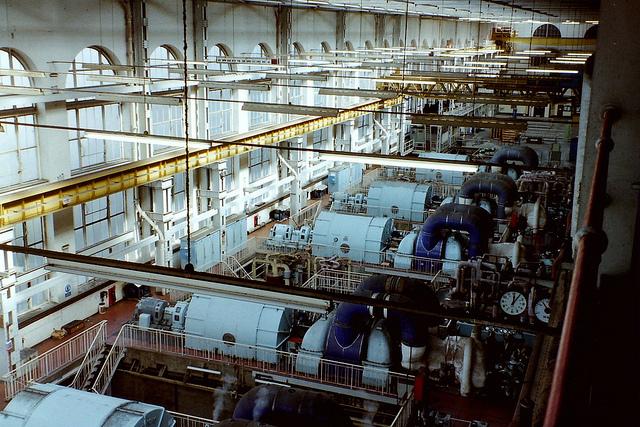 The power station was refitted several times during its life. 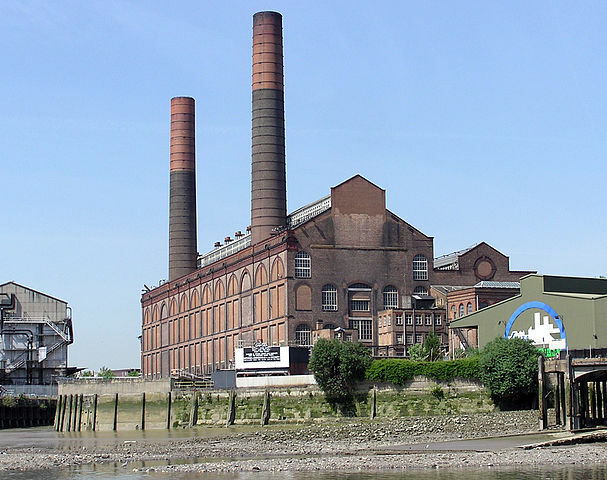 During the late 1960s it was converted to burn oil instead of coal, and its generators were uprated, allowing the power station to serve the new Victoria Line. It was at this point that it lost two of its chimneys, giving Lots Road Power Station the distinctive and slightly unbalanced end-profile it still retains. As time went on, the building’s original design was compromised, and the large windows on the boiler hall were bricked up, leaving a blind arcade (the arches alongside the chimneys were always blind, never glazed). Other windows were blocked up, and repairs and maintenance were carried out with little regard to the appearance of the building, which suffered as a result. London Transport and its successors eventually decided that it had become uneconomic to generate bespoke electricity for the Underground. It was cheaper to buy electricity as an industrial customer from the National Grid, with all the economies of scale from which the latter benefits. So the decision was made to run Lots Road Power Station down, operating until its equipment reached the end of its life, which it did in 2001. At this point the lovely control room was lost though several of the control panels were saved by the London Transport Museum. The power station and its surrounding lands were sold for redevelopment, and it’s taken ages to get the resultant residential and office project going. It’s a complicated site which straddles the border of two London Boroughs (meaning two planning authorities needed to grant planning permission) and there were arguments over the size of two new residential towers on the site. Finally, however, in 2013 London mayor Boris Johnson was able to ceremonially break ground on the redevelopment. “The towering Lots Road power station is a magnificent reminder of our Victorian heritage,”¹ he announced, demonstrating that his grasp of history is little better than his grasp of transport planning. Lots Road Power Station is of course an Edwardian building, Queen Victoria having died four years before it opened. Formation Architects has worked on the plans for the ex-power station. Some 260 flats will be inserted into the structure, and the huge bricked-in windows opened out again with glazing and balconies. Here, Lots Road Power Station is lagging behind Battersea Power Station, which is being redeveloped for residential units, office space and a hotel. It’s a reminder of a time when city metro train operators were pioneers in electric transport, just as city bus operators are today. It’s lovely that Lots Road will survive as a testament to this period of innovation, and as a dramatic part of the urban environment.